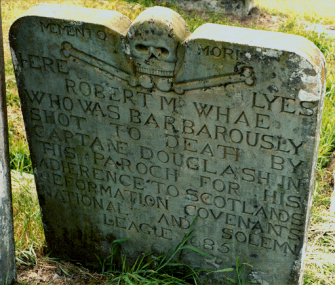 Robert MacWhae was shot in his own garden within the parish of Borgue in 1685 by Colonel James Douglas. Little else is known about MacWhae. MacWhae's gravestone is a small headstone located in the old kirkyard of Kirkandrews. The old headstone was damaged and was replaced in 1855 by a replica.